Can Bigfoot Keep Feral Dog's as Pets? Baboons Do. Hamadryas baboon outside of Ta'if, Saudi Arabia with "pet"
In the documentary, "Animals Like Us." there is a 3 minute clip (see video below) that suggests that Hamadryas baboons kidnap puppies and integrate them into their troops as pets. 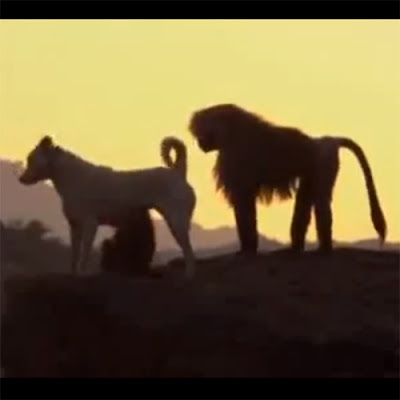 These loyal pets, risking their lives, then protect the baboon troop from other feral dogs in the area. It has been speculated by multiple Bigfoot field researchers that Bigfoot follow coyotes packs. Could it be the other way around? Could those packs be following and protecting Bigfoot? 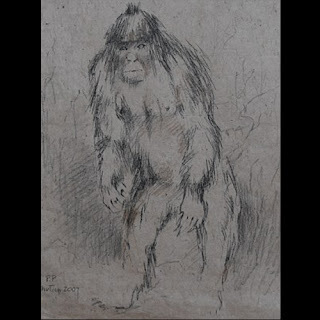 Before we get it from both sides, the skeptics who would correctly say this is quite an extrapolation and the paranormal Bigfooters that may think we can't glean anything from flesh and blood primates, let's admit that Bigfoot is all speculation. There is so much that we don't know, so we have a policy at BLC, that nothing is off the table. With that said, we even went the extra mile to see if this baboon behavior was actually real or due to some creative editing. Besides, if true, at the very least this is interesting primate behavior. There are worse ways to put Bigfoot and baboons together. First watch the video below. We should warn you, the first minute of the baboon kidnapping the puppy is quite disturbing. At least, it was hard for us to watch it. If you can get past the first minute, the rest of the clip has a happy ending where baboon and dog seem to have a symbiotic relationship. Is this video legit? Is this real behavior known to primatologist in the region and elsewhere? Hal Herzog, a Professor of Psychology at Western Carolina University, asks this same question in a DEC 2010 article titled, "Do Wild Baboons Kidnap Puppies for Pets?" Herzog does not completely dispute the behavior, but tries hard to determine the scientific authenticity of the documentary. I got a break when the ever-curious David Hinton decided this was worth chasing down. David soon discovered that the YouTube clip was from a British nature series called Animals Like Us. Then we stumbled on the Facebook page of the Saudi Arabian American Baboon Research Association. I contacted them immediately. They were, indeed, familiar with the Ta'if baboon troop, but they knew of no documented evidence that the baboons kept dogs as pets. The researchers had seen baboons kidnap kittens, but they have not studied these relationships systematically -- a future project, they promised. But the big break came when we decided to try to trace the baboon-dog connection through the dogs. The dogs at the trash dump appeared to be a type of natural breed called Canaan dogs. Natural breeds, sometimes referred to as "pariah dogs," are found in many parts of the world, often on the outskirts of human settlements. They tend to be mid-sized animals with short hair and pointy ears (here). Often tan or brownish, they resemble Australian dingos in size and shape. They are called "natural breeds" because the dogs pick their own mates and are not subjected to the arbitrary aesthetic rules of human overlords. Within a couple of hours, David and I had independently contacted a microbiologist and Canaan dog expert named Duncan Schroeter. Duncan became interested in Caanan dogs while he was engaged in a research project in Saudi Arabia and had adopted several of them as pets. (See here) In an email, he told me he knew about the baboons at Ta'if and had tried, unsuccessfully, to get Saudi wildlife officials to investigate their curious relationships with dogs. He also mentioned that baboons and dogs easily intermingle at a different site in the Asir region of Saudi Arabia. Then Duncan raised the big question. He wrote, "Are these baboons and dogs merely tolerating each other in areas where both can find food or are they truly living together with the dogs staying with the baboons when they move away? It is easy and more sensational to put any interpretation on commercial "documentaries." Three days ago (10-29-2012) BLC reached out to Hal Herzog for any updates and this was his reply. I recently found out who the scientific advisor to the French film crew was. I wrote him to ask about new developments but have not heard back. If I find out anything of interest I will write a blog post on it. 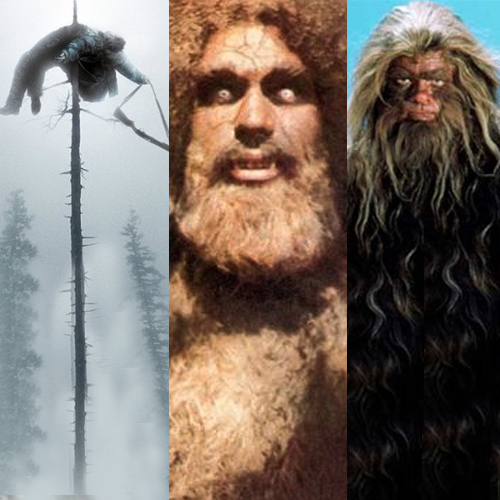 Just in time for Halloween, the folks at the website, Not Coming to a Theater Near You, have been reviewing the Sasquatch Cinema from the 70's every Friday this month of October 2012. These reviews of "Sasquatch Cinema" are a part of a larger annual installment, going on it's 9th year, called 31 Days of Horror. What they call Sasquatch Cinema, we call Sasquatchploitation. Surprisingly they review one movie, Shriek of the Mutilated, that is completely off our radar and not on our Top 51 Sasquatchploitation Movies List. The reviews are by David Carter and really excellent reading if you enjoy film in general. Below you can read an excerpt from the four reviews so far this month. [John] Carradine anchors the film as Jasper Hawkes, a Southern traveling salesman who has made his way west with his associate Elmer (John Mitchum, Robert’s older brother). Radiator trouble leaves the pair stranded on the roadside for a time, but they make a hasty retreat after Elmer finds a massive footprint on the banks of a creek. High above them, the beautiful Joi is having engine troubles of her own and is forced to parachute to safety when her Cessna loses power. Joi lands on a heavily wooded mountainside, and she barely has time to get her bearings before she’s grabbed by a pair of large, hairy arms. Boggy Creek’s narrator informs us that his first encounter with the Fouke Monster was an indirect one. “I was seven years old when I first heard him scream. It scared me then; it scares me now,” he muses, impressing that the creature is both authentic and something to be feared. The film reiterates this idea of authenticity subtly in the scenes immediately following, which introduce the small town of Fouke, Arkansas. The rural southern charm of the town is emphasized in such a manner as to imply that the residents of Fouke would be incapable of deception and are knowledgeable enough about the local fauna to be able to correctly identify an animal or, conversely, know when they came across an unknown animal. Shriek of the Mutiliated is the story of a trip to investigate Yeti sightings by Professor Ernst Prell and his graduate students, Tom, Lynn, Keith, and Keith’s girlfriend, Karen. The Yeti is Prell’s pet project – actually, obsession – and rumors that a previous expedition ended in disaster frightens the students. At the expedition site upstate, the students are introduced to Prell’s collaborator, Dr. Werner, and his imposing Native American manservant, the mute Laughing Crow. Werner gives Prell the welcome news that he has seen and heard the creature in the area recently, and the team begins their hunt early the next morning. Tragedy strikes the group almost immediately as Tom is attacked by a hulking monster with shaggy white hair. The remaining team learns of his fate much later, after a day of searching only finds Tom’s partially eaten leg. Sasquatch draws its influence from the Bigfoot films that preceded it, most notably 1976’s The Legend of Bigfoot. In addition to the likely intentional mimicry of the title, Sasquatch takes that film’s main focus – real life wildlife expert and Bigfoot hunter Ivan Marx – and essentially replicates him for its main character, Chuck Evans. Those who have seen Legend will be familiar with Marx’s frequent poetic musings about nature, ecology, and his mysterious prey, and Sasquatch’s Evans provides similar commentary during the film’s mostly uneventful trek to the fictional Peckatoe River Valley in western Canada. The similarities between the two films’ narration is intentional, as is Sasquatch’s appropriation of Legend’s overall structure and the documentary format. To the unfamiliar, Sasquatch would appear equally as authentic as Legend or any other Bigfoot documentary film—a technique that would greatly enhance the impact of the film’s conclusion. Russia Announces DNA Test Results of Kemerovo "Yeti Hair"
Today the Daily Mail published the headline "Sasquatch in Siberia? Hair found in Russian cave 'belonged to unknown mammal closely related to man'"
Yeti news from Russia usually upticks this time of year, culminating to its highest peak towards Western Siberia's Yeti Day celebrated on November 11th. You can read our post earlier this month about the Yeti hair mentioned in today's article. We also have a huge collection of posts regarding Yeti's in the Kemerovo region. You can read the Daily Mail article below, as well as watch the accompanying video. Astonishing claims were made in Russia today that DNA tests on suspected 'Yeti hair' reveals the existence of 'an unknown mammal closely related to man'. The 'tests' were conducted on samples of hair found in a Siberian cave during an international expedition last year. 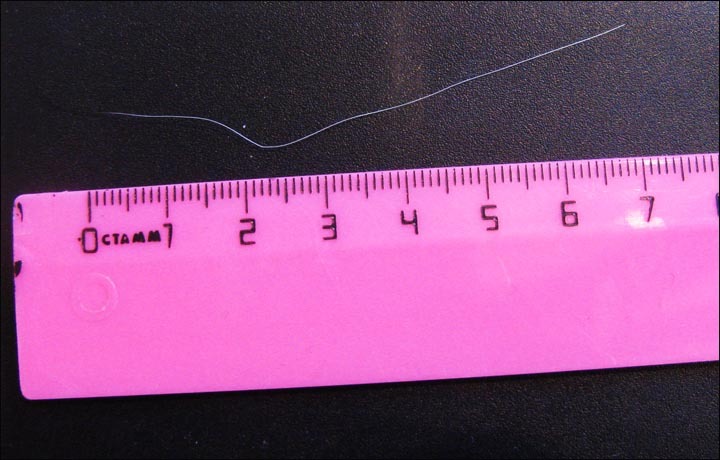 'We had ten samples of hair to study, and have concluded that they belong to mammal, but not a human,' said Professor Valentin Sapunov, of the Russian State Hydrometeorological Institute. Nor did the hair belong to any known animal from the region such as a bear, wolf, or goat, he claimed. Analysis was conducted in the Russia and US and 'agreed the hair came from a human-like creature which is not a Homo sapien yet is more closely related to man than a monkey', said the Siberian Times, citing claims made on a regional government website in Russia in the area where the hair samples were allegedly found. 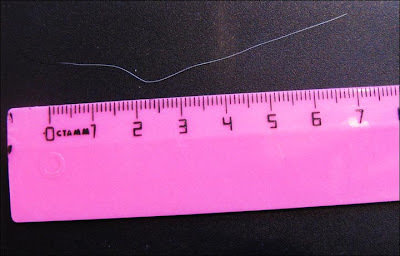 It stated that long-awaited scientific tests were conducted on their hair at two institutions in Russia and one in Idaho in the US. The tests were undertaken on hair found one year ago in the Azasskaya Cave in the Mourt Shoriya area of Kemerovo region in Siberia, it was alleged. The 2011 expedition to the remote cave complex in Kemerovo when the alleged Yeti hair was found was led by Dr Igor Birtsev, seen as Russia's leading advocate of the existence of the abominable snowman. He last night questioned the conclusions saying he was seeking more information about the alleged tests. The Siberian Times said only 'scant' details were made available of the 'DNA findings'. Sapunov claimed that the prestigious Zoological Institute of Russian Academy of Sciences was involved in the tests. Yeti 'sightings' have been reported for centuries in most continents but the creature has evaded capture and no remains have ever been discovered. Several 'sightings' of yetis have been made recently according to a Russian official and fishermen in Siberia. 'We shouted to them - do you need help?,' said fisherman Vitaly Vershinin. Russia's leading researcher on yetis, Igor Burtsev claims around 30 of the 'abominable snowmen' live in the Kemerovo region, where these sightings were. Spike TV is gonna make it rain money for some lucky adventurer--if they can prove Bigfoot exist. This is the largest cash prize ever offered on TV. read the full press release below. NEW YORK, Oct. 25, 2012 /PRNewswire/ -- Spike TV is raising the stakes in the endless quest to discover the truth about the legendary creature known as Bigfoot, the seemingly mythical being that roams forests of the world, avoiding mankind. The network is announcing a new one-hour reality show, "10 Million Dollar Bigfoot Bounty," featuring ambitious teams of explorers on a brazen exhibition to unearth real evidence of Bigfoot's existence. The $10 million in cash, underwritten by Lloyd's of London, would be the largest cash prize in television history. "10 Million Dollar Bigfoot Bounty" is produced by Charlie Corwin's Original Media ("Swamp People," "Ink Master") with Corwin, Michael Riley and Emmy® Award-winner Jon Kroll ("The Amazing Race," "Big Brother") as Executive Producers. 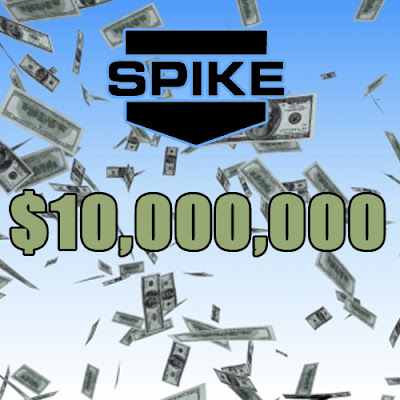 Spike TV has ordered 10 one-hour episodes. The network has already begun casting contestants for "10 Million Dollar Bigfoot Bounty," which will feature scientists, zoologists, seasoned trackers, and actual Bigfoot hunters who all believe in the infamous creature's existence. The teams will be faced with the daunting task of proving to a group of experts that Bigfoot, the hairy ape-like sasquatch, exists with the irrefutable evidence. The winner will be the first team to secure proof – and win the unprecedented $10 million bounty. Each episode will follow the different teams as they ply their extensive research and presumed knowledge of the legendary creature, often battling nature's inhospitable conditions. The series will be shot in various locations throughout the country. Sharon Levy is Spike TV's Executive Vice President, Original Series, Tim Duffy is Senior Vice President of Original Series for Spike TV, and Chris Rantamaki and Justin Lacob serve as the network's Executive in Charge of Production. Show updates will become available at bigfoot.spike.com. Aaron Sagers (left) is a CNN contributor who will host a new show on the Travel Channel called Paranormal Paparazzi. Self-imposed as Skeptic-in-chief, Sagers leads a team of reporters as they go out and investigate unexplained phenomena. The series premiered in late September and plans to run 8 episodes in all. Unfortunately non of the shows slated for the first season have anything to do with Bigfoot. 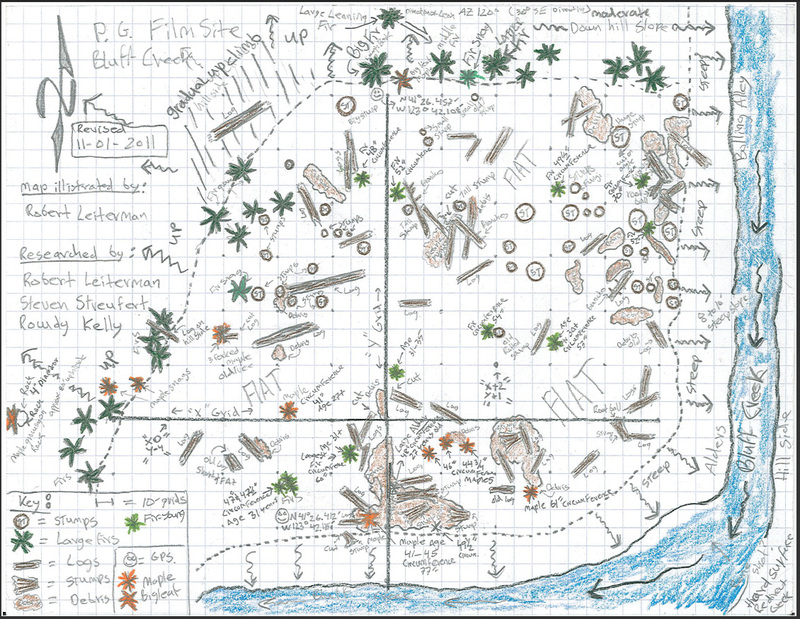 There's ghost, UFO's and zombies--but no Bigfoot. Bigfoot, however is the topic of a teaser video published on the The Travel Channel' website. It is short video of the team discussing the physicality of Bigfoot. The man with the glasses who does most of the talking in the video is not a Bigfoot expert, but a ghost expert. His name Joshua P. Warren and is best known for making the cover of the scientific journal, Electric Space Craft, in 2004 for groundbreaking work on ghostly plasmas. Watch the video below and decide if you agree with joshua P. Warren. Adam Davies, a well-known cryptozoologist will be prominently featured in this next season on Finding Bigfoot during the Sumatra episode. He is best known for his research on the Sumatran version of Bigfoot a/k/a Orang Pendek or little foot. Lori Simmons, Author of Tracking Bigfoot, has a family legacy with a creature we have come to know as "Bigfoot". Her father tracked Bigfoot for 28 years in the Cascade mountains. Adam Davies, Author of Extreme Expeditions: Travel Adventures Stalking the World’s Mystery Animal. He is also a well-known expert expeditionist and has appeared on Nat Geo’s “Russian Bigfoot” and “Ape-man”; Monsterquest’s “The Real Hobbit,” & more! Helene Olsen and Patricia Baker will interview both Bigfoot researchers, Lori Simmons and Adam Davies who recently had an extreme close encounter and captured the event on camera. Simmons and Davies each have a long history of searching for unidentified creatures and will share details of their latest adventure for the first time on radio. 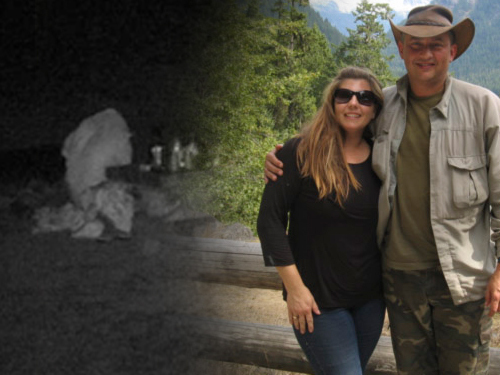 Recently Lori led Adam Davies and another investigative team to a location where they obtained video footage as well as photographs of an unknown creature. The video provides a chilling glance at some type of large creature looking in on Simmons and Davies as they slept. The photo and video (below) provides a chilling glance at some type of large creature looking at Lori & Adam as they slept. BOSTON, MA--(Marketwire - October 23, 2012) - Angels Lighthouse Radio show on the LNMR network is breaking big news for their listening audience on Thursday, October 25, 2012, 7:30 - 9:00 PM EDT. Hosts Helene Olsen and Patricia Baker will interview two Bigfoot researchers, Lori Simmons and Adam Davies, who recently had an extreme close encounter and captured the event on camera. Simmons and Davies each have a long history of searching for unidentified creatures and will share details of their latest adventure for the first time on radio. Simmons also has a family legacy with the creature we have come to know as Bigfoot. Her father tracked Bigfoot for 28 years through the North Cascade Mountains. Simmons recently published their book, Tracking Bigfoot, and is continuing her Bigfoot explorations in the Pacific Northwest. 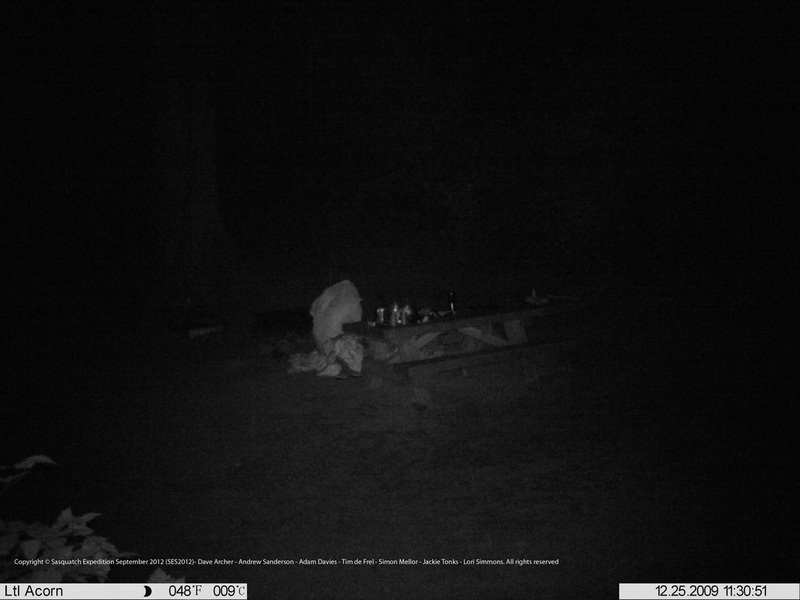 Recently Simmons led Adam Davies and another investigative team to a location where they obtained video footage as well as photographs of an unknown creature. The video provides a chilling glance at some type of large creature looking in on Simmons and Davies as they slept. Davies is the author of Extreme Expeditions: Travel Adventures Stalking the World's Mystery Animals. He is also a well-known expert expeditionist and has appeared on Nat Geo's "Russian Bigfoot" and "Ape-man"; Monsterquest's "The Real Hobbit," "China's Wildman," and "The Abominable Snowman." Angels Lighthouse is a very popular show on the Blogtalk LMNR Radio network. The show features unusual, paranormal topics, breaking paranormal news and free psychic readings by world-renowned psychic/medium Helene Olsen. Shows are conveniently archived at http://www.angelslighthouse.com. 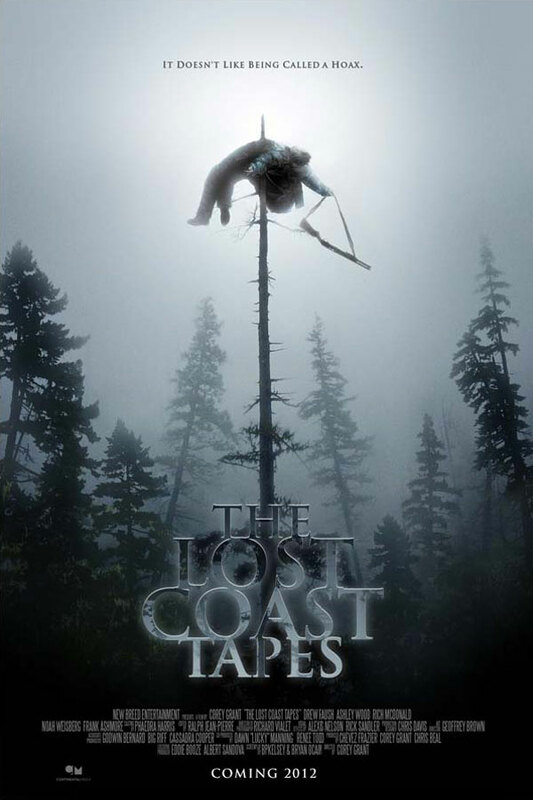 The Lost Coast Tapes is one of four Bigfoot "found footage" films released this year. The other three titles are Exist, Bigfoot County, and the internationally award-winning film The Woodsman. 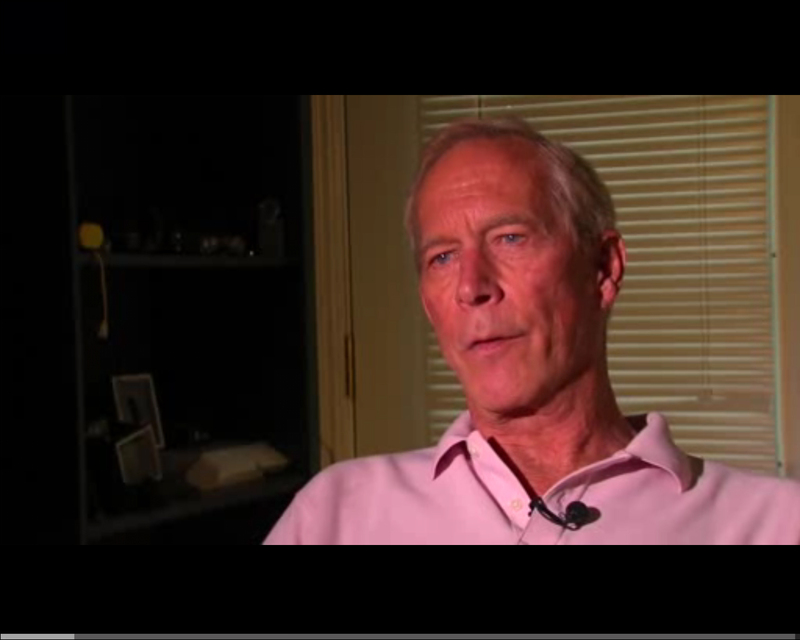 In an interview published October 13th , 2012, MovieWeb talks to Bigfoot: Lost Coast Tapes director, Corey Grant. Our favorite part of the interview is where Grant talks about Bigfoot in popular culture referencing Leonard Nimoy's In Search of, The Bionic Man's Bigfoot, and Sid & Marty Krofft's Bigfoot and Wildboy. Below is an excerpt of grant reminiscing about these various Bigfoot, including his own approach to his movie's Bigfoot. So you probably grew up with In Search Of, in an era when Bigfoot was fairly new, and pretty scary to kids of our generation. Corey Grant: (Laughs) My friends and I have probably watched that clip on Youtube a million times. We are reminiscing and laughing, because we didn't know how funny this thing was at the time. And they would drive around and have adventures together behind the couch. I know what you're about. I see where this movie is coming from! Corey Grant: No, I haven't really seen too many Bigfoot movies, to be honest with you. I remember seeing something when I was about six or seven. I don't know what it was. But it freaked me out about Bigfoot. I haven't really seen anything since then. I did see Harry and the Hendersons, but that was completely different. You should look up Bigfoot and Wild Boy. It's from the Kroffts, the guys that did HR Pufnstuf and Sigmund the Seamonster. It was about this kid that was left in the woods as a baby. Bigfoot raised him, and they became this superhero team. Corey Grant: Are you serious? Corey Grant: I want to see that! There have been so many different bigfoots over the years. What went into crafting the look of your particular Bigfoot? Corey Grant: We had a guy who created a design for us early on. But we had to go with the Jaws approach, where its more affective the less you see of the body. You see glimpses. But you don't really see the details. Where I think a lot of people go wrong, unless you are really intent on spending a lot of time and effort in getting this right...Every movie has a different look for Bigfoot, and when they just put it out there, I think it loses the audience. New York State Department of Environmental Conservation? In a press release yesterday (10-22-2012) Peter Wiemer, of the Chautauqua Lake Bigfoot Expo, announced, "Bigfoots / Sasquatches are a Protected Species per the New York State DEC..."
This is based on a letter to Peter Wiemer signed by the New York State Department of Environmental Conservation (NYDEC). Huffington Post ran an article disputing the claim, we received a copy of the letter written from the NYDEC to Peter Wiemer today. Please read below. I am responding for Commissioner Martens to your recent e-mail requesting protection for "Big Foot" or "Sasquatch". This is also a follow up to our recent phone conversation regarding the same. As discussed on the phone, the DEC does not recognize the occurrence of Big Foot in the state, therefore it is not addressed directly in our hunting regulations. Because it is not addressed there is no open season on Big Foot and they may not be taken. We are confident that the current laws and regulations afford adequate protect for Big Foot if one were to be found in NY. Under the current laws and regulations you and others are free to pursue Big Foot for the purpose of documenting their existence provided none are harmed and you abide by the laws and regulations pertaining to trespass on private property and use of public lands. For information on the use of DEC managed lands see our website, www.dec.ny.gov. I hope this response addresses your concern. Please feel free to contact me if I can be of any further assistance. Protected species? Maybe not, but depending how you look at it, Bigfoot does seem to be protected by default because the NYDEC does not recognize Bigfoot as occurring in the state. Even if they do not recognize the occurrence Bigfoot, the dept. does seem to acknowledge that Bigfoot do occur, especially when they give permission to "...pursue Big Foot for the purpose of documenting their existence provided none are harmed..." You could argue that the letter proactively forbids any harm coming to Bigfoot. Peter Wiemer, of the Chautauqua Lake Bigfoot Expo, requested in a letter dated July 29, 2012 to New York State Department of Environmental Conservation Commissioner Martens to enact a non hunting regulation of Bigfoots in New York State. 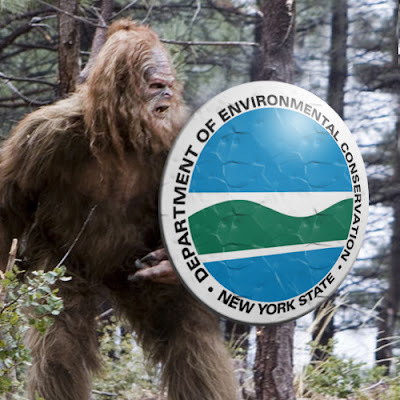 The NYS DEC official response made by Mark Kandel on the Commissioner’s behalf, stated, “the DEC does not recognize the occurrence of Big Foot in the state, therefore it is not addressed directly in our hunting regulations. Because it is not addressed there is no open season on Big Foot and they may not be taken.” By not being listed in the hunting syllabus of NYS, any non-listed species then becomes a Protected Species per my phone conversation with Mark Kandel said Peter Wiemer. Bigfoot, also known as Sasquatch, are large human like beings covered in hair and standing upwards of eight to ten feet tall. Steve Kulls, a Bigfoot researcher from the Adirondacks, NY reported at the Expo that the first documented sighting of a Bigfoot in the USA was in Sackets Harbor, NY in 1818. This, along with many other documented sightings in NYS over the years, has raised the interest level in Bigfoot as well as in protecting these beings from being mistakenly hunted for sport or food as being allowed in the State of Texas. 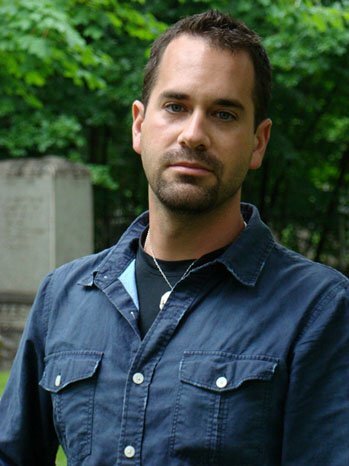 Peter Wiemer, an award winning special events director, created the Chautauqua Lake Bigfoot Expo because of his genuine belief in Bigfoots as well as the popularity of Bigfoot inspired TV shows. The Chautauqua Lake Bigfoot Expo was written up in the August 2013 issue of Convene Magazine, and is currently the only Bigfoot convention in New York State. The 2nd annual Chautauqua Lake Bigfoot Weekend & Expo is planned for April 26th, 27th & 28th, 2013. More information along with pictures and videos can be found at the Expos website. Below is the excerpt from the Huffington Post article from the NYSEC perspective, although as you can see from the information above, it is not the full story. In an email to The Huffington Post, Kandel denied that his department took any such action. "New York State has taken no action with regard to listing or protecting Bigfoot," he said. But sasquatches aren't without some legal protections, according to a previous email from Kandel to Wiemer which stated that, "there is no open season on Bigfoot and they may not be taken." 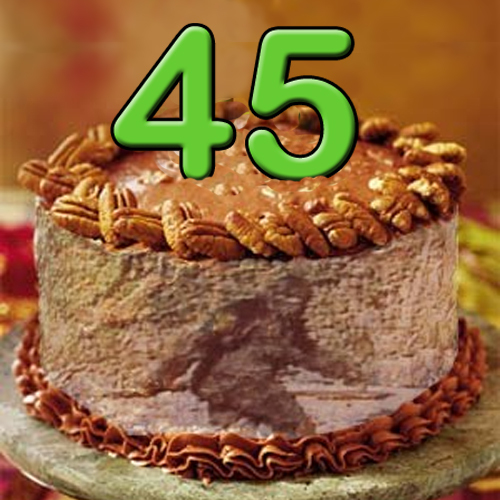 The Bigfoot Thermal video is still considered one of the most compelling videos in recent history. Also known as the Squeaky Footage, due to the squeaky toy used to draw the Sasquatch in, this film was recorded by former EMT Mike Green. Mike Green will be visiting the Archdale library to speak and answer question. You cane read the details below reprinted from the Courier Tribune. ARCHDALE — Bigfoot researcher Michael D. Greene will talk about his nationwide quest for the legendary beast at 7 p.m. on Friday, Nov. 2, at the Archdale Public Library, 10433 S. Main St., Archdale. The event is free and the public is invited. Greene has a master of science degree in behavioral psychology, is a court-qualified Questioned Documents Expert and for 20 years was Chief Investigator for a state fraud bureau. He is a pilot and a former EMT and an 18-year member of the National Ski Patrol. When not “Squatching” he can be found sailing his catamaran “ALL I ASK” out of Norfolk, Va.
For more information, contact Jonathan Farlow at (336) 431-3811 or jfarlow@randolphlibrary.org. This last September (2012) a Craigslist ad went viral and was picked up by MSNBC news. It was later determined to be a prank, but not before it was reported on MSNBC.com (see below). Add Bigfoot research to the recession-proof industries. A website called All over Albany has alerted the Internet to a job opening on Craigslist that — for a primate-lover with an open mind and a (preferably) four-wheel-drive vehicle — could be the opportunity of a lifetime. "Not for profit organization, located in Whitehall, NY is a high-energy, team-oriented research entity that is involved in the tracking, documenting, and study of cryptozoological creatures, with a deep interest in the study and search of bipedal primitive apes. We seek an experienced researcher with a deep understanding of cryptozoology, primatology, with a good background with scientific research and interest in great apes." 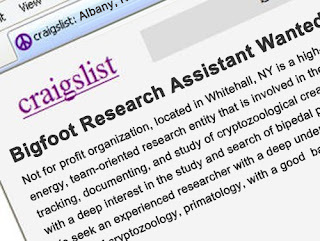 Some of the research assistant's responsibilities will be to "investigate, document and interview individuals with reported Bigfoot sitings (sic)," and an appropriate candidate must be prepared for "occasional travel to remote areas of Adirondacks including spending several nights in the wilderness, checking motion cameras, collecting hair and dung samples for laboratory analysis amongst other related activities." Develop actionable tracking program in designated geographic area. Investigate, document and interview individuals with reported Bigfoot sitings. Occasional travel to remote areas of Adirondacks including spending several nights in the wilderness, checking motion cameras, collecting hair and dung samples for laboratory analysis amongst other related activites. Must have own transportation, four-wheel drive a plus. Compensation: based on experience, this is a grant funded position and is expected to last 6 months with the possibility of renewal. Today (10.23.2012), a Florida weekly paper, Broward Palm Beach New Times interviewed the prankster to determine how he got the verbage for the compelling ad. When asked about how he came up with such clever phrasing and job duties to include the ad, Reeves explained that he had watched a Bigfoot special earlier in the week on the History Channel and remembered the lingo dropped by various cryptozoologists. Adding in the fact that the position was grant-funded and would likely only last six months was a stroke of genius. But the Internet has a way of revealing dirty little secrets, and one commenter was quick to point out that Reeves' ad wasn't all that original after all. And New Times wasn't the first news outlet to go bananas over the prospect. As documented in this MSNBC article and this All Over Albany article, somebody hit an upstate New York Craigslist board with the same posting. As far as we can tell, neither of these outlets bothered contacting the poster to determine the veracity of the post. "I took it from somebody else and added some stuff to it," Reeves said when contacted on Monday. The original ad isn't up on the New York Craigslist site anymore, as far as we can tell, so it's tough to figure out whether Reeves did in fact tweak and modify the ad as needed. He did at least change the locations to mention a few rural areas near the panhandle. By now you have heard of Dallas business man who claims to have taken a picture of several bigfoot, including a family group of three. You also may know he wishes to remain anonymous. In new reporting broadcast last night (10.22.2012) by ABC affiliate in Austin, Texas. The man plans on releasing more videos in the near future. You can read the article below followed by the KVUE.com video. DALLAS, Texas -- When you think of Bigfoot, you may think of the northwest. But, in recent years, there have been reported sightings in East Texas, and even near Dallas. 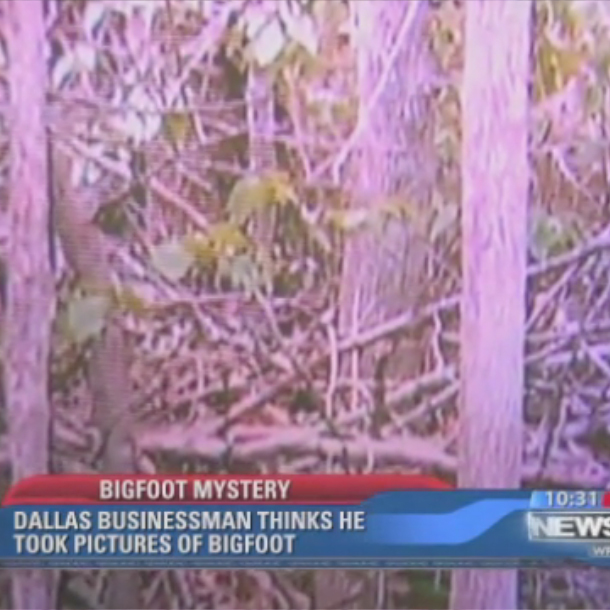 Now, a Dallas businessman said he has picture proof after snapping a picture in Shelby County. Once a non-believer himself, he said he is changed man after seeing something move in the woods. He grabbed his camera and captured an image of what he believes is the legendary Bigfoot. In the picture, a black area that could be seen as a figure is captured amongst the trees in a heavily wooded area. The photographer said that black area is the hairy creature. The photographer wants to remain anonymous. However, he won't be stepping back from his newfound discovery. He said he plans to release more video evidence in the future. In Texas, one area known for its Bigfoot sightings is Caddo Lake. According to the Texas Bigfoot Research Center, hundreds of sightings have been reported. The TBRC talked about the sightings in a 2006 Travel Channel documentary. While there are some who have debunked this photograph (see: Texas Photographer Snaps Picture of Bigfoot). We will be looking forward to seeing the new videos for the community to analyze. Hosted by Lauren Zima, TV Replay scours the vast television landscape to find the most interesting, amusing, and, on a good day, amazing moments, and delivers them right to your browser. Posted today, Oct 22, 2012, AOL/Huffington Post decided to review the New York Baby Bigfoot Episode of Finding Bigfoot. After showing clips from the episode, Lauren Zima shares critical tweets of the show regarding it's possible longevity to 5 seasons. Watch the video below after the article. The "Finding Bigfoot" team headed to upstate New York to look into the famous footage from 1997 of an alleged "baby bigfoot." 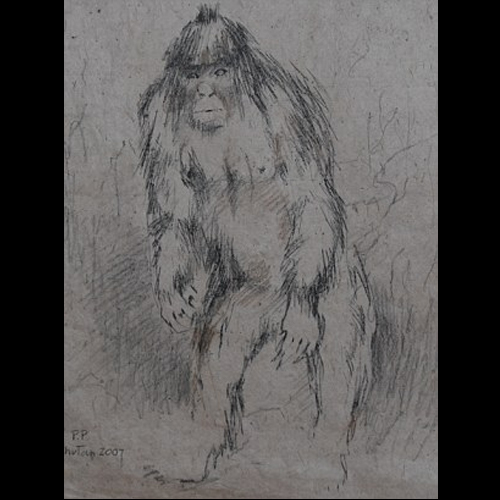 The footage showed what was described as "either a case of a pet ape or a Sasquatch." The team explained, though, that chimpanzee expert Jane Goodall looked at the footage and was certain that the creature seen in it was not a chimp. So they ventured into the woods and tried to lure the creature -- or one of its brethren -- by whistling. They heard a knock in response, which James explained is a Sasquatch communication technique. "They’ll do knocks to keep track of each other where they are, alert to danger, alert to other ones in the area," he said. It was enough to convince the team that there were Sasquatches in the area, but viewers of the show seemed less certain. Matt Braiman tweeted, "Fifth season of Finding Bigfoot? If you haven't found him yet he's probably not there." "Finding Bigfoot" is actually heading into its third season -- though the argument could still be made -- premiering Sunday, November 11 at 9 p.m. ET on Animal Planet. A fourth season has been commissioned, with a fifth likely, according to the show's Wikipedia page. "No, I've never seen one , never believed in one," -- Texas photographer, who wishes to remain anonymous, believes he has now had his first Bigfoot encounter. **UPDATE: Astute BLC fans, Oscar Grogg and Bobby Kean, alerted us to Phil Poling's insightful analysis of the Bigfoot photo. You can watch it at the end of this post. In a report filed yesterday, October 21, 2012, KLTV reports of a Texas man who is convinced that he may have snapped a picture of Bigfoot after having rocks thrown at him. The investigation was done by Mike Hall of TexLA ,a Cryptozoological research team. Below is an excerpt of the report followed by embedded video. There have been reported sightings of bigfoot in remote East Texas locations, and even near Dallas, and a photographer says he has proof that bigfoot may be closer than we think. 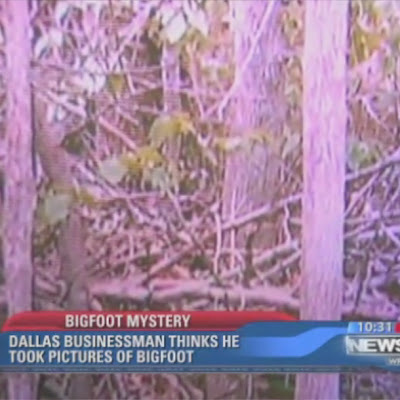 The Dallas area photographer, who remains anonymous , was never a bigfoot believer by his own admission. "No, I've never seen one , never believed in one," he says. But a huge stone thrown at him in the woods one camping trip, with no one else around, changed his mind. "An object landed within ten feet of us that I know of no human being able to throw it that far. There was one about 10 foot tall. A family group drew in close, three of which got within 15 feet of me. It looked like something out of a Steven Spielberg movie, not human as I know it," he says. He shot images in Shelby county of something moving in the woods. Outside of Dallas he shot images of something large and hairy watching from the trees. But light and shadow can play tricks. East Texas bigfoot researcher Mike Hall and his team from Texla crypto zoological research examined the images to see if they have merit. "Some of the shots you can actually make out what looks like a pair of eyes. There is something there staring back at him taking video. There is something there, question is, what is it?," Hall says. One shot looking very similar to the Roger Patterson bigfoot film of 1967. A crest or conical ridge on what appears to be the head. "The cone looking head, in the still shot that's very compelling, something definitely moving across the brush just observing," says fellow researcher Larry Parks. The photographer is keeping his identity anonymous but did say he would be releasing more video evidence in the future. On Friday October 19,2012 PennLive.com published an article about a Pennsylvania man who claimed his Winnebago was vandalized by Bigfoot. Embedded directly below is the first video, further down the post is the new video from ABC news. If state police catch the vandal who threw rocks at John Reed’s motor home in Lykens earlier this month, the perpetrator could face criminal mischief charges. Not big news. But state police troopers better have strong handcuffs if they make the arrest. The accused is Bigfoot, according to the complaint that state police issued Friday morning. The cops description lists the suspect as very large, brown in color and walks somewhat hunched over. According to Reed, who filed the complaint, a Bigfoot type of creature is responsible for smashing the windows and taillights out of his 1973 Dodge Winnebago. The incident took place just after midnight along a dirt road off White Oak Road in state game lands in Jackson Twp. State police at Lykens issued a press release later Friday morning saying they were investigating it as a criminal mischief complaint. When contacted, the trooper said the investigation is not being actively pursued, pending further evidence. Nor, he said, is Bigfoot likely to menace any area residents — this is the first complaint the state police have received. But should the Sasquatch in question be apprehended, Dauphin County District Attorney Edward M. Marsico Jr. said his office would prosecute the Sasquatch. Even if Bigfoot did exist, it may not fall under the commission’s jurisdiction anyway, he said. “I think the question is whether or not the Game Commission would have jurisdiction on a hominid mammal,” he said, adding there is always a debate over jurisdiction when reports are received of whales or dolphins swimming up the Delaware River in Philadelphia. Even though they are mammals, as ocean dwellers they may fall under the auspices of the Fish and Boat Commission. “Being a hominid mammal, this may be something under the Department of Health ... or it is a matter for the state police” Feaser said. A Pennsylvania man has his eye on a large, furry and elusive suspect who he accused of vandalizing his 1973 Dodge Winnebago. 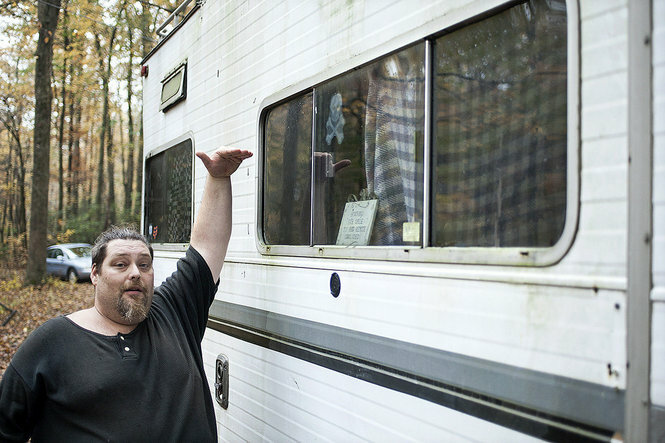 John Reed, a self-described Bigfoot tracker since the age of 10, said he was camping with his girlfriend when he saw the creature walk past his motor home window. Reed said the Bigfoot, also known as Sasquatch, reportedly threw rocks at his mobile home’s outside light to escape discovery. Reed, who is the founder of the Lykens Valley Sasquatch Hunters, and his girlfriend, jumped into their truck and gave chase, making special ‘Bigfoot calls’ to locate the creature. This alleged sighting is the third time Reed said he has come into contact with the creature. While police believe the damage may have been caused by vandals, for Reed it was a warning from Sasquatch to get off his territory. Website ShockTillYouDrop.Com recently sat down with Bigfoot: The Lost Coast Tapes Director Corey Grant. We pulled out the best quotes. Click the following link for our previous coverage of Bigfoot : The Lost Coast Tapes. Bigfoot: The Lost Coast Tapes picks up after a "Bigfoot Hunter" claims to possess the body of a dead Sasquatch. A disgraced investigative journalist stakes his comeback - and the lives of his documentary film crew - on proving the find to be a hoax. Shock Till You Drop: Let's talk Bigfoot. Growing up, where did you fascination with this creature begin? Shock: Nice! Okay, so where did The Lost Coast Tapes come from for you...beyond your passion for the Six Million Dollar Man? Grant: Well, I'm a big fan of Bigfoot. Anything supernatural, I would watch and research. Then, two friends Bryan O'Cain and Brian Kelsey, who wrote the script, Kelsey grew up where a lot of Bigfoot sightings occurred. His family owns this cabin deep in the woods and he said, as a little kid, he would remember Bigfoot footprints he would take pictures of. So, he came up with a treatment for the script. And we thought about doing a good story that stayed true to the actual story and that it would be a no-brainer. It just snowballed into getting the movie made. Grant: I'm more of a traditional filmmaker and the only found footage films I had seen were The Blair Witch Project and Cloverfield. I wasn't so much a fan of found footage until last year. We went back and forth with the script on this - going between traditional narrative and found footage, but we wound up making it a part of the script. We then did traditional and found footage, but wound up cutting out all of the traditional stuff because it just didn't work. With the found footage, it had to be very well choreographed. It looks random, but the shots we had were very well crafted to get the compositions that I wanted. And finally the answer we were hoping for. Grant: It was set up that way, but it's definitely going to happen. The thing is whether we do something traditional or more found footage. The thing is, I didn't know there were that many found footage films coming out now and that there was a stigma coming with it. Now I have to fight around it and that's a bummer. It's going to happen, we're just not sure what style it will be yet. Click the following link for our previous coverage of Bigfoot : The Lost Coast Tapes. Bigfoot: The Lost Coast Tapes premiered to limited venues this weekend find you local showing at Fandango. Meet us at the Space Room Lounge on Saturday October 20th at 3:00 pm. Free prizes will be available for those who attend. Plus, you'll get to talk to Guy Edwards in person! 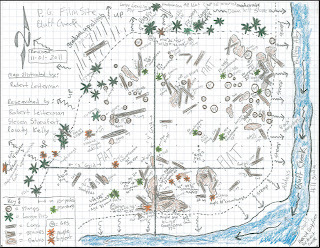 The November 1st (2011) corrected and revised map, drawn by Robert Leiterman.